Li Lianpao, a delegate at the 1978 Fifth National People’s Congress for his hometown of Shishi City, Fujian Province, announced on Thursday via his blog and Sina Weibo account that he is quitting the Chinese Communist Party. 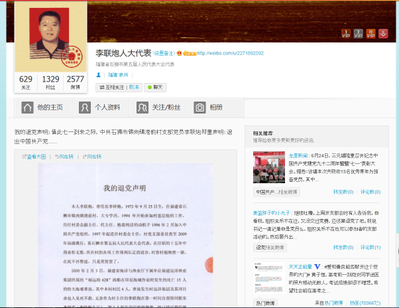 Although his post on Sina Weibo, a Twitter-like microblogging platform, has been deleted by Chinese censors, his blogpost is still available at the time of writing. In his blogpost, Li cites a fishing boat accident that happened six years ago as the beginning of his disillusionment with the Chinese Communist Party (CCP). On February 3, 2008, an accident involving a fishing boat that belonged to the Fujian Distant Seas Fishery Corporation resulted in 15 deaths, leaving only 5 survivors. Four of the victims were from Li’s village of Gangqian in the Jinshang Township, where Li was head of the village Party committee at the time. Li’s elder brother, Li Xiangmou, was the owner of the ship. The two had traveled to Indonesia, where the accident took place, to attempt rescuing the people, but soon realized that the Corporation and the contractors were unwilling to help. Along the way, Li wrote, “there developed a large amount of evidence pertaining to the corruption and dereliction of duty of the departments and Party leaders involved.” Though he did not delve into the details, he said he reported the issue to relevant departments and began a process of “weiquan,” or seeking the protection of civil rights through the Chinese judicial system. To this day, Li said, the victims’ families have not received compensation, nor has the truth of the accident been revealed. The Fujian Province authorities had organized an investigation team and released a report on the accident, but it remains a “classified state secret,” Li wrote. In March 2009, his brother was arrested on suspicion of bringing a group of the victims’ families to Beijing to petition. According to Li, his brother was then sentenced to the Yong’an City Prison in Fujian Province under fabricated charges of “organizing others to illegal cross country borders,” where he remains to this day. Li named the Political and Legislative Affairs Committee (PLAC), a powerful Party agency in charge of the security system, as the responsible party for placing his brother in jail. Meanwhile, because of his relation to his brother, Li was constantly monitored, followed, and illegally detained by the local Party committee, including for a period of nine days in March 2010. In June 2012, Li said the township Party secretary sent police and other township government workers to destroy the land that Li’s family lawfully contracted, which is no longer arable. Most recently, in March 2013, around the time that major political meetings were being held in Beijing, Li was seized by police again and locked up in the township government building for a period of four days. Li says that whenever there is a national holiday or a “sensitive” date, police are sent to his home to monitor him. Since the Chinese Epoch Times established a website in 2004 for people to formally announce their withdrawal from the CCP and its affiliated organizations, close to 141 million have quit the CCP through the website. Despite his lengthy description of the events leading up to his decision to quit the CCP, Li ended his statement saying that he still “firmly believes in communism, Marxism-Leninism, Maoism, and the theory of ‘socialism with Chinese characteristics’ that comrade Deng Xiaoping constructed.” Yi speculated that his contradictory wish to both quit the CCP and embrace communism may be due to fear of persecution after his statement is released. Last week, 5,000 veteran Party members from Hunan Province who had screened Communist propaganda films during Mao’s era publicly renounced the CCP.